The 'Ministry of All the Talents' was a coalition government formed under William Wyndham Grenville after the Tory William Pitt's death in January 1806. The members of the 'Ministry of All the Talents' were known as 'Broadbottoms' because of their wide political spectrum and their large posteriors. They are imagined here transformed into suicidal swine throwing themselves into the sea. 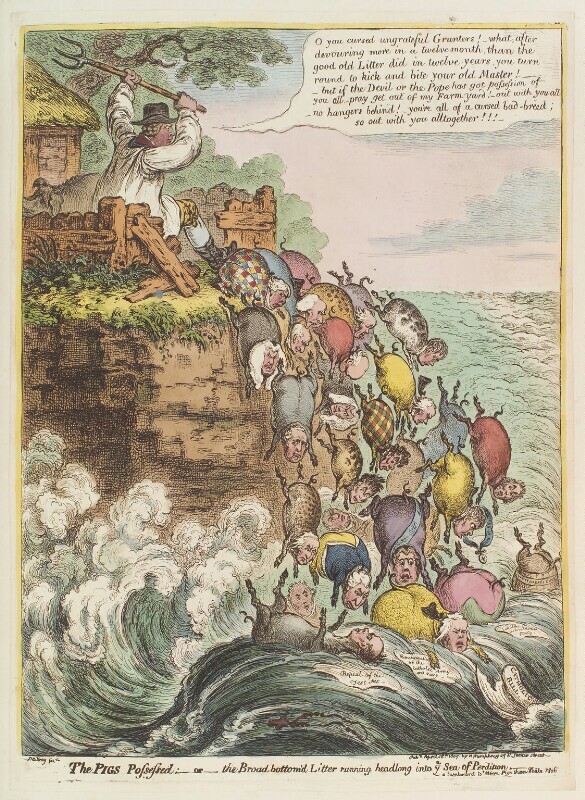 George III is returned to his role as the long-suffering 'Farmer George', herding his unruly government off the edge of the cliff. A tardy Sheridan, reluctant to quit office, is kicked away to join the others. The fall of this coalition ministry after only 15 months in office was precipitated by the King's strong opposition to the Army Bill which proposed to extend Catholic emancipation to the armed forces.